NuyWant to wear those heels but are too shy because of cracked feet? Then, this post is for you. We’ve listed down what we think are the best foot files to give you that fresh and nice-looking feet you’ve always dreamed of. There are several reasons why the Amope Pedi Perfect Electronic Foot File is the best foot file. First, it is electronic so it gives you fast and visible results after just one use. Its roller head also spins 360 degrees so you get perfect results every time. Its rollers are refillable—they even come in 3 different textures to suit your needs! Each item already includes 4 AA batteries which we think is very convenient. Plus, its handle is so soft and ergonomically-designed for filing with no effort. It can only be used on dry feet, and remember to only use light to medium pressure so the skin won’t become sore or inflamed. 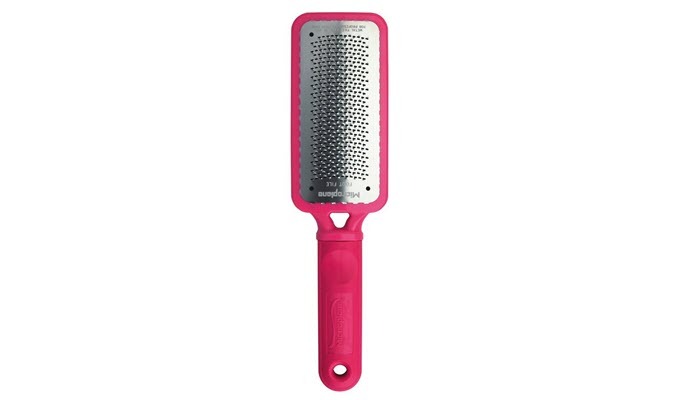 The Microplane Colossal Pedicure Rasp is a good addition to any pedicure kit. Plus, you don’t need to soak your feet before filing which is perfect! What makes this product great is it has a large surface. You can now remove any hard or thick skin easily and with just half the effort. Just remember to be gentle—you don’t want to do more harm than good. It’s also very long-lasting. It still lasted for more than 6 months even after using it once a week, which we think really gives value for your money. The PIXNOR Foot File consists of a rough side to grind thick and dead skin and a smooth side to refine and smoothen feet. It can be used on both wet and dry feet, and its handle is made of plastic and can last for several months with proper care. Speaking of handles, it has a hole at the end so you can easily dry and store it after use. It has a large head and a firm handle so you’re assured it won’t slip out of your hand while using it. It is also small and lightweight so it’s perfect even for traveling. 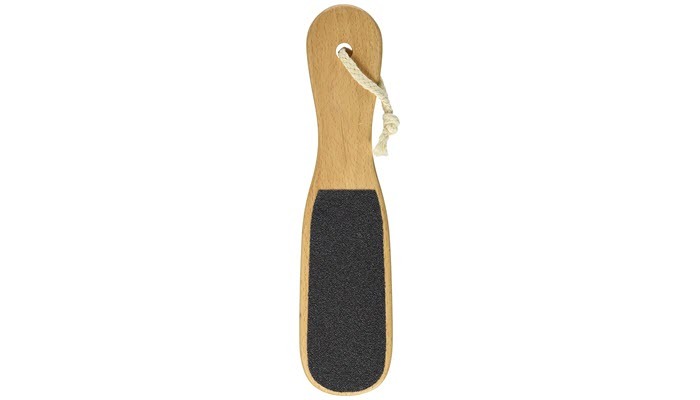 Crafted from European Beech Wood, the Diane European Foot File is made for durability. It has a red coarse grain side to remove callus and a black coarse grain side to smoothen feet. Take note that the red side is for dry feet while the black side is for wet feet. We also like that it has a hole at the end to conveniently hang it after use. But, some say that this product is only good if you don’t have a lot of thick skin on your feet. These are made from nickel or stainless steel and are strong and rust-proof. Some brands even come with a removable footpad and are more expensive than the other types. These were once used only at the salon since they were expensive. Most people like this type because they get to file their feet with little to no effort. These are the most common type of files and usually the cheapest. The grit is attached to the top side of the file and unfortunately, are quite flimsy so you must replace them frequently. 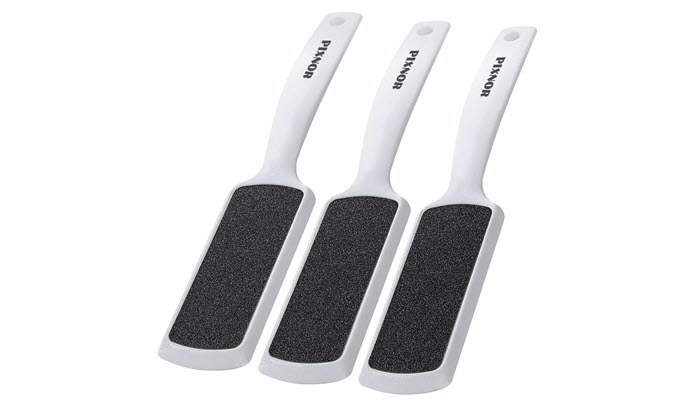 These are metal foot files with plastic handles and small blades that look like a cheese grater. This type works best on cracked heels. Just be careful when using these—they can remove a lot of dead skin cells in just one swipe! These are sturdier compared to plastic files and look like a small paddle. The grit is sandpaper attached to the file. Hang this type when drying and don’t let it get damp or else it will rot. Choose your preferred foot file. You can pick from the choices above. Get a basin and fill fit with water. The basin should be big enough that your feet are submerged into it, and the water must be hot as you can stand but not to the point where it burns you. Add in your favorite soap, salts, or scent. Make this your “me time,” so go for something that relaxes you. You can choose from the following options: Epsom salt to exfoliate and treat fungal infections. Essential oils like peppermint, lavender, or lemongrass for their antifungal properties. Soak your feet for 10 to 15 minutes to get your skin as soft as possible. Take a towel and dry your feet after soaking. Make sure they’re dry enough so you can use the foot file effectively yet moist enough that they remain soft. Check your feet and feel for any rough areas. Focus on areas usually affected by thick skin like the heel, ball of the foot, the sides of your foot, and the top of your toes. Place one foot on the opposite knee and start filing the parts you thought were rough. If only a little bit of skin comes off, this means there’s only a bit of thickened skin there. But if you can still feel hard skin, try using the other side of the file. Repeat on the other foot. If available, use a pumice stone to further remove remaining dead skin cells. Remember that pumice stones are rough, so be gentle and don’t push too hard. Check your feet again for any rough spots. If they don’t feel completely soft, repeat steps 7, 8, and 9. Moisturize your feet using oil, cream, or lotion and focus more on areas you filed. Also, make sure the cream/oil locks in moisture well. Massage feet to help improve circulation, reduce tension, and stimulate the muscles. 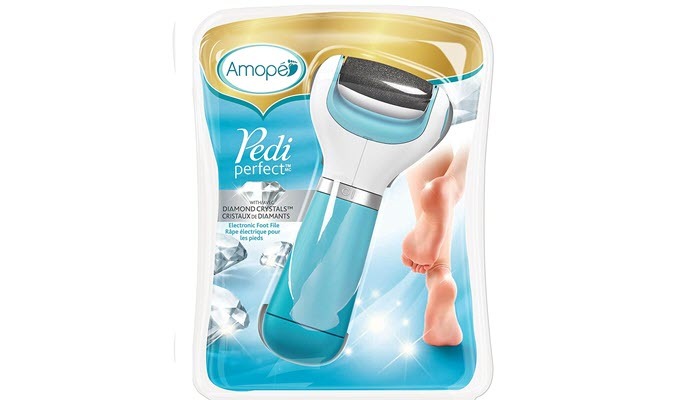 The Amope Pedi Perfect Electronic Foot File is our pick as the best foot file. It has a roller head that spins 360 degrees to give soft and smooth feet without the effort.